"Old Tucson; a hop, skip and jump history from 1539 Indian settlement to new and greater Tucson"
THE APACHES INSURRECTION OF THE PIMAS. DECLINE OF THE MISSIONSERECTION OF PRESIDIOSEXPULSION OF THE JESUITS. ARRIVAL OF THE FRANCISCANSABANDON- MENT OF THE MISSIONS PRESIDIO TIMES. 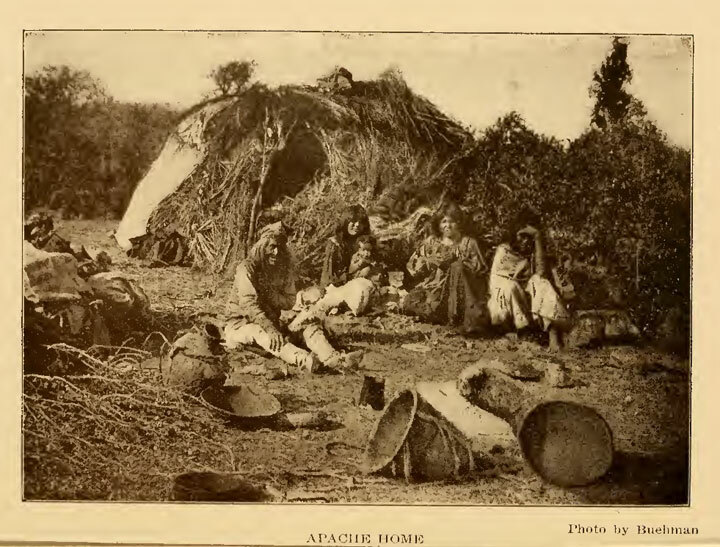 But the one great drawback to civilization and progress in Arizona was the Apache Indian. He was the omnipresent evil, and like some people who are never so happy as when they are miserable, so, the dreaded Apaches were always at war even in	times of expected peace stealthy, treacherous, greedy, too lazy to earn a livelihood except by thievery, they were a constant menace to civilization from any source toward any direction. Pima tribes of Arizona that in 1751, about sixty years after the founding of the prosperous missions, drove the naturally resentful Pimas to revolt, for they knew no release from the harassments of the merciless foe, and driven to madness, they rebelled; many of the priests were killed, and several of the missions were destroyed. After this insurrection the vice-regal government erected the presidios of Tucson and Tubac, and maintained therein small garrisons for the protec- tion of the missions. In 1765 a royal decree from Madrid ordered the expulsion of the Jesuits from Spain and her colo- nies, but as the order was not carried into immedi- ate effect, it was 1767 before they left this country. The results of this expulsion, however, were so severe that the Arizona missions never recovered from the blow, though in the following year, 1768, fourteen Franciscan friars arrived in Tucson from Mexico, to take the places of the banished Jesuits. Yet a Steady decline of the missions followed and in 1828, by order of the Mexican government, the missions were entirely abandoned; the colonies were despoiled by the savages, and the few escap- ing the barbarians, took refuge in the presidios. By the close of the Mexican War, 1847, these terrible Apaches had driven from what was then called Pimeria Alta, almost every vestige of civilization, and years of precarious living for the presidios of Tucson and Tubac followed. A temporary chapel in the presidio, in the early days, was dedicated to the use of the military and its few other occupants. The town was walled for many years, probably not less than one hundred and fifty, and was built in the form of a square, the wall rising about five feet above the flat roofs of the houses, affording fine breastworks for the defense of the Pueblo; the rear end of the houses was built into, and against the heavy wall surrounding the little settlement. The only door allowed was the one opening into the open square in front. The flat roofs, in the summer time, furnished fine family sleeping rooms. The little fort was also built in the form of a square, with a tower at each corner, fitted with loop- holes or small windows for outlooks, and for firing on the raiding Indians. The old records say that several times the wild Apaches made well organized and desperate attempts to capture Tucson, under their bravest and ablest leaders, and over one thous- and. ra-rriors strong, but they were always repulsed, Tucson, being the most northerly of the Spanish set- tlements, was a constant check upon those cruel Indian raids, which often penetrated even northern Old Mexico. One authority claims that in 1800 Tucson was garrisoned by about one hundred regular Spanish soldiers, and consisted of one hundred and fifty adobe houses, with a population of three hundred and fifty, nearly all of whom must have been Mexicans and Indians. © 2010. EMOL.org / Entertainment Magazine On Line / AZentertain. All rights reserved.